- Baker's transform. An optical tranformation, applicable to images. Used for instance by Stéphane Trois Carrés for his Electronic Wallpaper. - Optical realization of the baker’s transformation (PDF) by J. H. Hannayt, J. P. Keating and A. M. Ozorio de Almeidas. - For textures, see [Ebert]. - The higher it is, the more beautiful are the results. Example of a banner, for a web news magazine. - Ad on a web page. Commercial banner on a Web page. - Printing mode (on an indefinitely wide paper). - of data: see base. - Digital Baroque. New media art and cinematic folds, by Timothy Murray University of Minnesota Press 2008. 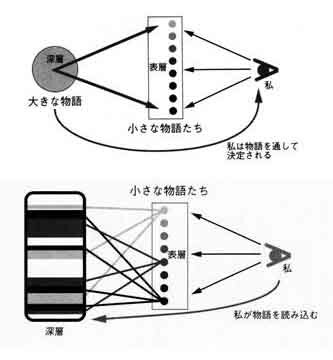 The data base model of Generation Otaku, by Hiroki Azuma ( 2001). - Graphic computing: layer [Photoshop].
. Used in artistic projects, see Legrady, Muntadas, RYbN, and the Net Art.
. A Japanese concept about post-modernism and the Otaku generation.
. Data base in Roxame, see Roxame Assets. BD. Standard name, more commonly termed Blue ray disc, blue-ray or bluray. Wikipedia. - Generally speaking. See aesthetics. - Beauty of the body. See perfume, hairdo, fabrics, jewelry. Behavioral (art) , behaviour, behavior. - See living art. See notes. - List of steering behaviors and references by Craig Reynolds. < Behavioral programming, by David Harel, Assaf Marron and Gera Weiss. CACM July 2012. - Subject of the thesis of Elise Aspord. < Behavioral Animation, a chapter signed by Jean-Sébastien Monzani, Anthony Guye-Vuilleme and Etienne de Sevin. in [Magnenat]. - Notes about behavioral animation on the Irisa website. - The behavioral art according to Daily Planet, 11/30/2009. - Video of behavioral art on the Waterloo bridge in London. Image of a being, by Alain Lioret. Being. See our special notice. Bilinear ( matte). See [Agoston]. Bimedia. Joint use of paper and Internet. "Several local editions of the Parisien are experimenting the bimedia" (Le Monde du 5/10/2011). Bio art. See special notice. - Wikipedia, art press and/or the artists websites are in general well documented on this topic. And we give links to them. - It's more difficult and useful to comment the works. We translate here Paul Valéry (Introduction à la méthode de Léonard de Vinci): "... the author, fortunately, is never the man. The life of the latter is not the life of the former. All critics are dominated by an outmoded principle: man is the works cause, as the criminal is the cause of crime. Actually, they are its effect more than else! 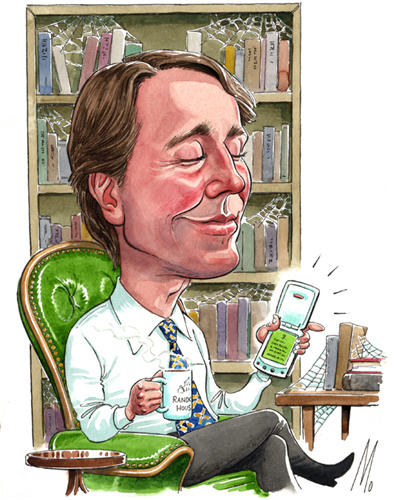 But this pragmatic principle makes easier the judge's work: biography is simpler than analysis. It teaches nothing about what we mostly look for... More! The true life of a man, always ill defined, even for his neighbor, is of no use to explain his works, if not indirectly and to the cost of a very careful elaboration". - Nevertheless, in diccan indexes, mainly for synthesis and statistical analyzes, we give the country (birth or residence according to the cases) and the decade of the first digital work by this artist. Biorthogonal. 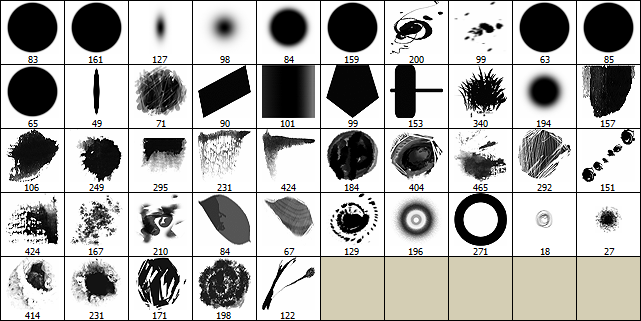 A feature of some filters, by which they are apt to good reconstructions from sub-bands. See [Gonzalez]. - Bit-depth: depth in bits of a pixel [Brinkmann] or of a sound sample (in this case, must me combined with the sample rate to indicate the recording quality). - Bit plane. A coding and processing technique which limits inter-pixels redundancy. See [Gonzalez] p. 448 sq. - More in special notice. Bitmap. A set of pixels (possibly, voxels) representing an image as a raster of points (pixels), each one with its own color. - Programming: [Foley], [Flash], [Photoshop]. Blade. Generally used in plural. - A component of musical instruments, mainly music boxes (Wikipedia), harmonicas and accordions. See instruments. - A kind of computer hardware, for example PCs or servers. 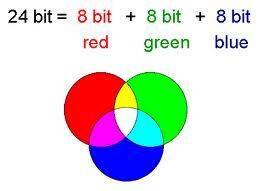 - There are two basic methods to blend colors: additive and subtractive. But many others can be thought of. It is an aspect of compositing. - Programming: [Foley], [Processing], [Photoshop]. - Blind deconvolution is an image restauration technique, using a degradation function. See [Gonzalez] p. 256. One of the first blob architectures, by Lars Spuybroek (NOX) and Kas Oosterhuis. Called The Water Pavilion (1993-1997). Blob. Binary large object. A priori; it has no particular structure. It may be an image, for example. .
- The term was created (admittedly by Greg Lynn) to denote, in data bases, fields assigned to data much heavier than a traditional variagle. These files can be dealt with as any other fields, according to their type, of course (you cannot arithmetically multiply an image by another one). - In architecture [Picon] indicates that the term has been important aroud the eighties, but that its use is declining at the beginning of this centure. He comments " The arbitrary development of volumes could explain the dramatic waning of the blobs... in spite of their diffusion beyond the borders of digital architecture proper". (Our approximate translation of "Le degré d'arbitraire qui semble s'attacher aux volumes pourrait bien expliquer le déclin spectaculaire des blobs... malgré leur diffusion au-delà des frontière de l'architecture numérique proprement dite"). Blog, blogosphere. See the online dictionary of blogs. - About blogs and transmedia, several notes in [Rose] and [Bernardo]. < Technomedia. Jeunes, musique et blogosphère. by Anne Petiau. Seteun 2011. The author is a sociologist. < Créez le bloc parfait, les trucs ultimes pour un bon workflow avec votre CMS. Five pages in Web Design 12/2010. - A blog, rigorously structured and daily augmented since 1999 is "Le crépuscule des jours" combining poetry, wisdom and photography. Blue Ray, or bluray, or blue-ray, popular names for the standard BD term. Bluescreen. [Brinkmann] . See alpha channel. Blur, blurring. These basic functiosn are very common, and the simple ones are easy to write. But they can be heavy in computation time. - For stump, see [Brinkmann], [Gonzalez], [Java], [Processing], [Roxame]n [Photoshop]. The simplest method is to take the average of values on a region of pixels typcally 3x3 or 5x5) centered on the target pixel. The processing time grows rapidly when the region size is increased. - Median blur. Instead of the average, you sort the values of the pixels in the region, and choose the median one (for instance, the 4th high one on a matrix of 9). The result looks frequently cleaner that the average blur. But the computation times grows even more rapidly with the matrix size. - Random blur. It is not exactly a "blur", but gives pleasant results. Principle: replace the color of the target pixel by the color of a pixel chosen at random, in a region around the target pixel, as above. Here, the computation time does not grow when the zone is enlarged. You can find source (very easy) in [Roxame]. - On images [Bres] tells about movement blur. - On regions, the blur issues are presented by Ken Perlin in [Ebert] pp. 337 sq. - Fuzzy sets and fuzzy logic are not, as far as we know, used in digital arts. - Representation of the body: model, poser, expression (including face, gesture) , eye, texture, animation, uncanny valley, cloth (see fabrics); - Perception of the body by the work: perception (including sensors, capture ), camera, vision, eye-tracking, brain-to-computer. < Recovering the Body. A Philosophical Story. by Carol Collier. The University of Ottawa Press, 2013. < Body hacking. Pirater son corps et redéfinir l'humain. by Cyril Fievet. FYP 2012. Interview in Internet Actu, July 2012. Nothing artistic, but a lot of examples, mostly of electronic implants. < Mon corps est une manette (Aymeric Renou, in Le Parisien du 11/10//2010, about Microsoft Kinect). - Information to tye body: haptics, pain. - Cyborgs, body hacking, handicap. - (Text). The thickness of lines forming a letter is higher than on the standard font. - (Image). A line may be more or less thick. Thickness is more appropriate here than boldness. Book, Bookshop, bookstore . See diccan's notice. Boost. Filtering , see [Gonzalez]. Border . Many pages in [Bres]. A function in [Java]. Programming: [Brinkmann], [Foley], [Agoston], [Zomorodian], [Processing] and a lot of things in [Gonzalez]. Boxcar. Smoothing filter [Cocquerez] p.139. Brain/computer and brain to brain communication. See note. Breeder, breeding. Developing a population, focusing mainly on individual beings and their reproduction. 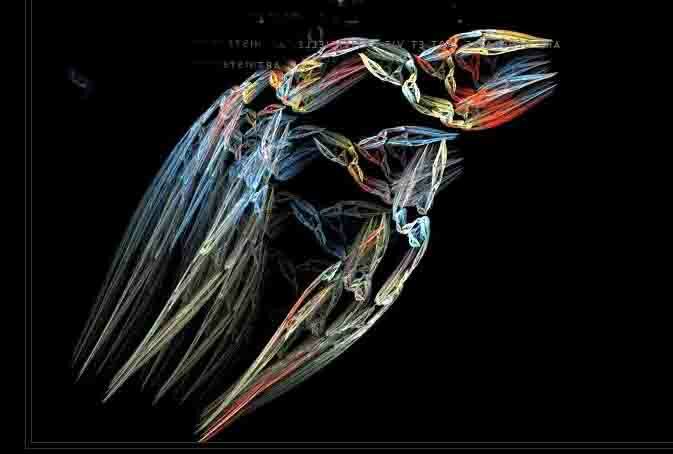 - In artificial life software, opposed to biotopes by [Whitelaw]. 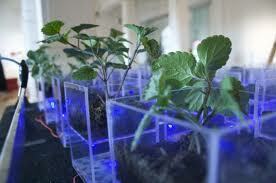 - In bio-art, breeding and gardening are traditional forms of art. - [Ebert] uses this example to explain procedural textures. - A general name for "component". Brownian (movement) [Ebert] gives here long pages (fBm, fractional Brownian motion). - For text display, a color parameter. - See notably [Flash], [Photoshop]. Example (in Processing, program by Xavier Gouchet). Brushes are shapes who afford to generate sophisticated drawings from the mouse, graphic tablet or a procedural program..
B-Spline. Line drawing algorithms. [Foley], [Seul]. BSC. Binary symmetric channel. Binary code reliability technique. See [Gonzalez] p. 428. - On comic strips, also called balloons. Wikipedia. Their automatic placement could be programmed. - In show halls, bubble machines or blowers may be taken as an effort for digital systems. < Archéologie du bug. A 4 pages article by Christophe Bruno and Emmanuel Guez, in MCD Sept-Oct-Nov 2014. Bump-mapping. Algorithms to modify the surfaces normal vectors in order to simulate holes or bumps. See [Foley] . [Ebert] shows how to do this kind of computation. Butterworth. A category of filters (high pass, low pass, band rejection, slots). Used notably for noise reduction. See [Bres] or [Gonzalez]. BYOA. Bring Your Own Animation. One of the Paris ACM Siggraph activities.